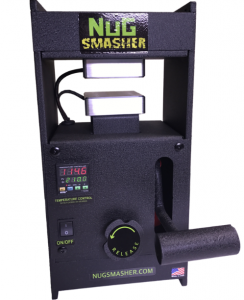 The NugSmasher Mini Rosin Press is the smallest rosin extraction system in the Nugsmasher line and is perfect for casual home use. It can process up to 3.5 grams of material at one time. True to its name, the Mini is only 14 inches tall and 7 inches wide, so you can keep it on a countertop, etc., without taking up too much space. Despite that, It delivers a full 2 tons of pressure through its 2.5 inch aircraft-grade aluminum pressing plates. They're are plenty of videos out there covering how to use this bad boy, but seeing it on this guys counter and the amount he gets out per “squish' kind of puits in all into perspective of what this mini machine can do. For the size and most importantly the price, this is one of our favorite rosin presses. As you can see from the videos on this page this little monster performs. High yields and ease of use, open the box and you are all set. Ready to rock and press! The one downside of the NugSmasher Mini is the simple fact that it's a manual press. We have grown spoiled over here and accustomed to the electric and pneumatic models. But if you don't mind putting a little elbow grease into a few cranks, then this is a perfect machine.